Is the hunt for #influencer status getting dangerous? As a child I remember eating sand which I am sure was well soiled. Just last week my eight week old daughter treated me to a casual vomit directly into my face. Also, I have been known to enjoy a Happy Shopper sausage roll every now and then. While all these things are pretty unpleasant, none of these reached my gob as part of some relentless quest to attract attention, fame and fortune. Today I read an article about a Chinese health vlogger that gobbled on a highly poisonous plant as part of one of her many livestreams. The influencer in training, Zhang, survived, albeit following an ordeal of rashes, blisters and a stomach pumping session. Having read this quite dreadful story, I was left worried about how hysterical we all have got about influencer marketing and the message its sending out. A constant stream of information on the potential earnings of high-profile influencers, alongside access to enough broadcast technology to make Murdoch blush, has created an intoxicating and enticing environment for both brands to be interested in and people to make their fortune. It's the modern day equivalent of the gold rush and is fraught with similar pit falls and dead-ends. We need to exercise caution both in the way we go about recruiting influencers and how we talk about them. What will swiftly see the demise of the influencer marketing landscape is a gaggle of teenagers poisoning themselves on YouTube in a bid to get offered free sneakers. If you're not genuine about your passion area, stay clear of being an influencer. If you're a brand, choose wisely and authentically. If you see an Agave plant. Don't eat it. Chinese health vlogger Zhang bit off what she couldn’t chew in a livestream — which landed her in the hospital. 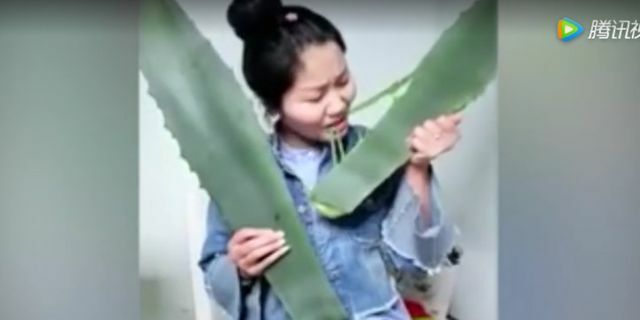 Zhang filmed herself eating what she thought was a massive leaf of aloe vera — which is probably not the best way to get aloe vera’s benefits to begin with. Regardless, what she was actually eating was Agave Americana, a highly-poisonous plant that looks very similar to aloe.